Harbaugh reverts to QB for workout. Randy Moss had a couple of poor-performance seasons with the Oakland Raiders, but impressed some people with a workout last week in New Orleans. Randy Moss will be catching passes in the Bay Area again, at least for one day. The 35-year-old wide receiver is working out for the San Francisco 49ers today. Moss sat out the entire 2011season after he bounced between three teams in 2010. Niners head coach Jim Harbaugh will get to relive his old “Captain Comeback” days during the workout. He will throw to Moss because league rules prevent any current 49ers from taking part in workouts with the team until March 13th. That’s when the new “league year” begins. At one time Harbaugh and Moss were both players in the NFL. Harbaugh’s career started in 1987 and lasted until 2000. Moss joined the league in 1998. Moss worked out for the New Orleans Saints last week. Reports out of that workout say Moss was impressive. Moss played on the other side of the Bay with the Oakland Raiders during the 2005 and 2006 seasons before being traded to the New England Patriots. 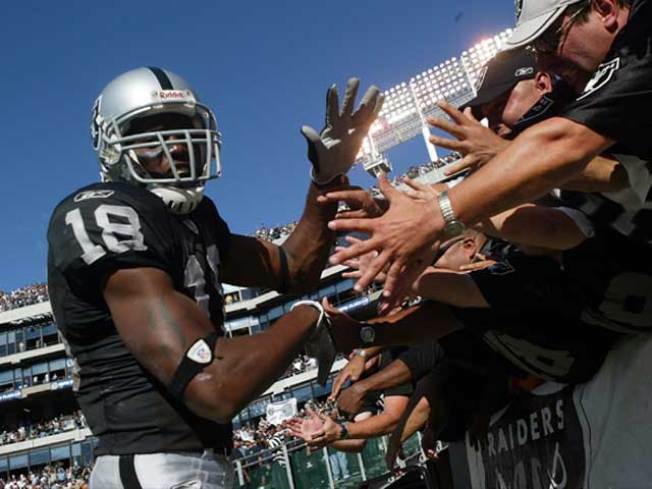 Moss had two of his statistically worst seasons when he played for the Raiders. The 49ers are looking for a go-to receiver heading into the 2012 season. Michael Crabtree led the team last season in receiving yards and but he only found the end zone four times.